Heat grill to medium heat. While the grill is heating up, add angel hair pasta to a large pot of boiling water, and cook according to the directions. Drain the pasta, toss with olive oil, and set aside. Brush haloumi and lemon slices with olive oil and place on grill. Grill cheese and lemon covered, turning over once, (3 to 4 minutes total). Set aside and cover to keep warm. Place fiddleheads in another pan and sauté in vegetable oil until soft, about 3-5 minutes. Remove from heat and add mushrooms to the pan to warm them back up. Rewarm grilled haloumi and lemon at this time if necessary. Bring remaining broth mixture to a simmer and add finely diced tomatoes, juice from the remaining half of the lemon, and reduce for 3-5 minutes; remove from heat and whisk in heavy cream. 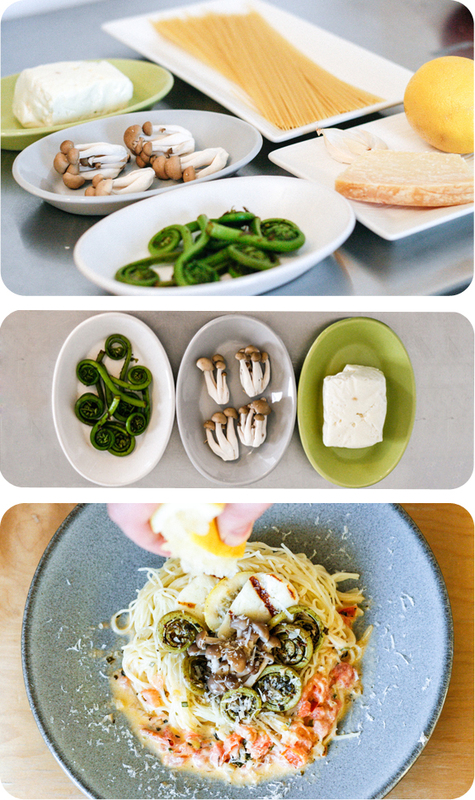 Make nests of angel hair pasta and top with mushrooms, fiddleheads and sauce. Place haloumi on the side and squeeze a lemon over it. Grate Parmesan over the pasta if you wish, and enjoy!